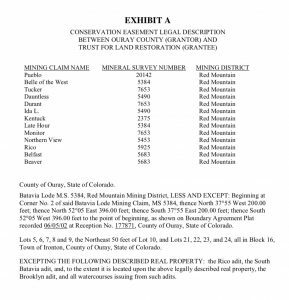 In 2002, as part of the Red Mountain Project, Ouray County acquired thirteen (13) patented mining claims and 10 town lots in and near the historic Ironton Townsite, in the Red Mountain Mining District of Ouray County, Colorado. The State Board of the Great Outdoors Colorado Trust Fund (GOCO), and the Idarado Natural Resource Damage Recovery Fund provided Ouray County with grants to assist with the cost of acquisition. Ouray County desires to promote the concept of open space and the creation of parklands within the County. To further this objective, Ouray County has acquired the property formerly owned by Marlene Garard (property identified in Appendix A) for the purpose of maintaining and preserving its conservation values, historical use and natural and manmade features. A conservation easement has been established on the property with the Trust for Land Restoration (Grantee) being the holder of the easement. TLR visits and monitors the property to assure that the terms and conditions of the conservation easement are being upheld and maintained by the County. The most significant existing structure on the property is the Larson Brother Mine office/changing room, located on the west side and adjacent to Highway 550, on a former Ironton Townsite lot, and now part of the Garard/Red Mountain Property. Other mining structure remnants on County-owned property are found southwest of the Larson Brothers Mine on the Beaver and Belfast patented mining claims. The Larson Brothers Mine opening itself is on property owned by the United States of America, and administered by the United States Forest Service. It is not owned by Ouray County (see MANAGEMENT TARGETS, below). This management plan is to supplement and define the various conditions identified in the Conservation Easement and the Baseline Report on the property. It is also a documentation of the proposed projects to be initiated on the property to preserve the historic structures, support the objectives of the Red Mountain Task Force and the Red Mountain Project, compliment the overall objectives of the San Juan Skyway program, further the objectives of the Ouray County Historical Society (OCHS) and ensure that public safety and the conservation values of the property are maintained. The timeframes for completing the various projects identified in this Plan are subject to the availability of resources, including funding and the approvals of the various agencies that may be associated with each project. The property is surrounded by United States Forest lands and some privately owned properties (mining claims). It is the intent of this plan to ensure that the property is managed in a manner consistent with the adjacent properties and to ensure that the traditional use of the property is maintained, while preserving its conservation values and ensuring the safety of the public in the use of the property. The Ouray County Historical Society provides assistance and support in the management of this property. OCHS is authorized to sponsor various projects that further the objectives of this plan, including seeking funding and doing project oversight. When projects are proposed, an agreement will be made regarding the various responsibilities to carry out the work plan(s). The following are the significant areas that will be addressed in the management of this property. The descriptions of the existing conditions and proposals for managing these areas are considered to be general in nature. More detailed planning will occur in each area as priorities are established and projects are developed. The west portion is covered with Aspen trees west of the highway and has a few conifer trees on the lots east of the highway. The east segment is a mixture of conifer and aspen with some small brush along gulches that have flowing water. No commercial logging will be allowed. However, it is prudent to maintain the forest in a healthy condition and it may be necessary from time to time to do selective cutting to improve forest health and remove trees that may pose a hazard to the public. Resources from the United States Forest Service and State Forest Service will be utilized to evaluate and make recommendations regarding maintaining a healthy forest. These recommendations will be reviewed with the Conservation Easement Grantee and a plan of action will be developed and implemented as may be required. Commercial timber harvesting is not allowed. Control of noxious weeds will be the responsibility of the Ouray County Weed Control Officer. An annual inspection of the site will be conducted between June and August each year to determine if there is a need to do weed control. Weed control will be carried out according to standard procedures and in a timely manner to maximize effective spraying or other control measures. The historic use of this property includes mining activities around the turn of the 20th century. There are several sites on the property that contain remnants of mining activity. These are identified in Appendix C. as Historic Building Envelopes. The locations are approximate on the maps and will be further defined when any project is proposed within the envelope. The most significant existing structure on the property is the Larson Brother Mine changing room/office, located west of, and adjacent to, Highway 550. Long thought to be IrontonSchoolhouse, in March 2016 Ouray County Historical Society’s Museum Curator Don Paulsonstudied historical photographs, and is positive this building is not it. Paulson’s research indicatesthat this building was in fact associated with the Larson Brothers Mine, either as a changing room, or as an office, or both (Paulson, 2016) . The Larson Brothers office/changing room is in fair condition and has weathered many years of heavy snows. It has experienced some vandalism damage, but the structure is deemed sound. In 2004, OCHS obtained State Historic Fund (SHF) dollars to have Silverton contractor Chris George re-roof the building (Paulson, 2016). This building is directly adjacent to Highway 550 and has the potential for historic restoration and possible use as an interpretive site. Ouray County had placed a sign on a post outside the building thanking GOCO for its contribution to the purchase of the property. By 2016; that sign had disappeared. In the original 2003 Garard/Red Mountain Management Plan, prepared by former County Administrator Ron Bell, the Larson Brothers Mine portal entrance was identified as being on the property. 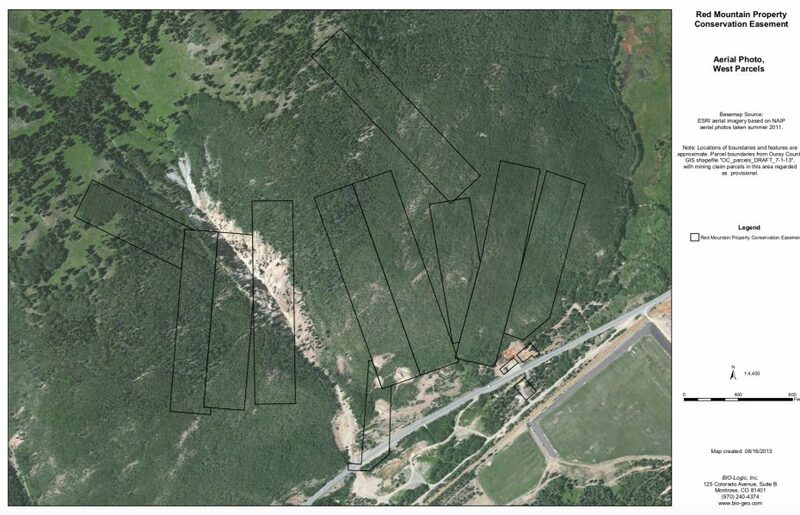 Subsequent review of the 2001 Phase I Environmental Site Assessment prepared by Rocky Mountain Consultants, the 2002 Baseline Inventory prepared by Bio-Logic Environmental, and 2014 aerial property boundary photos prepared by Bio-Logic, all show that, in fact, the Larson Brothers Mine portal is NOT on County-owned property (Willits, 2016). Review of US Forest Service land status maps (http://apps.fs.fed.us/fsmapviewer/index.html?config=public- config/ALP_StatusAndEncumbrance.xml) by Jeff Litteral of the Colorado Division of Reclamation, Mining and Safety show the Larson Brothers portal to be on property owned by the United States, and administered by the US Forest Service (Litteral, 2016). 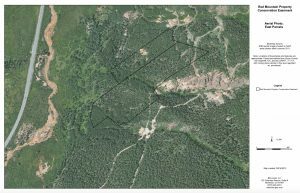 The 2003 Management Plan noted that, in addition to the Larson Brothers Mine, “there areremnants of other mine structures on this west parcel. These have deteriorated and may have little historic value. An assessment of these will be made and if any are deemed to havesignificant historical value, a plan for each will be developed”. It is not believed that anhistorical assessment of the site was ever undertaken. OCHS should be consulted to determine if one is needed. The 2003 Management Plan noted that there were “burned remains of a residential structure located on one of the property lots in the Ironton townsite” and that “an archeological review of the site may be made to determine if there are any artifacts that may have historic value.”Cleanup of this site was done to reduce the potential for public safety concerns. Trash, brokenglass, sheet metal fragments and nails were removed. It is not believed that an “archeological review” of the site was ever undertaken. OCHS should be consulted to determine if one is needed. The Conservation Easement Grantee will be notified when any plans are made for work on any of the structures, according to the terms of the Easement. Funding and manpower to conduct work on the structures will be determined through an overall planning program that may include other historic sites in the Red Mountain area. There are several adits and prospects on both parcels. Some have waste rock piles at the front of the adits. There are several prospects, which are minor pits that have little or no waste rock. Several depressions exist on the east parcel that may be the result of cave-ins of adits directly below. None of these other adits or prospects is considered to be a significant safety hazard. Periodic inspections of the property will be made to assess the potential public safety hazards relating to the adits and prospects. Appropriate remedial action will be taken to ensure these are made safe for the general public. Professional resources, including personnel from the State Division of Minerals and Geology may be utilized to assist in evaluating the conditions. Some waste rock was identified in an Environmental Assessment (August 2001) as having a potential health hazard. If this rock turns out to be anything more than mineral samples and further studies show that a real health threat exists at any of the waste rock sites, the County will evaluate the recommendations of recognized organizations or professionals and implement an appropriate plan to address the identified risk. The plan(s) will be reviewed with the Grantee prior to implementation to ensure it is meets the provisions of the Conservation Easement. The mining, re-mining or extraction of soil, sand, gravel, rock, oil, natural gas, fuel, or any other mineral substance for sale or any other economic purpose is not allowed. There are several established roads and trails on both parts of the property. These include both hiking trails, and motorized vehicle roads, all in a general primitive state. The roadways cross the east parcel and provide access to adjacent private and public lands. The objective of this management plan is to maintain the existing roads and trails in their current state. The Red Mountain area is popular as a four-wheel drive recreation site during the summer months. In the winter, activities such as Nordic ski and cross country skiing, dog sled racing and snowmobiling are common. It is anticipated that these activities will continue on this property to ensure a consistent use with adjacent properties and that snowmobile activity will be minimal and largely related to trail maintenance for skiing and dog sleds. Use of snowmobiles, all-terrain vehicles, motorcycles, or other motorized vehicles off of roads or travel ways, except for property-maintenance purposes, is not allowed. If additional trails or roadways are proposed, the Grantee will be notified and included in planning to ensure that the intent of the provisions of the Conservation Easement are carried out. The streets and alleys of the Ironton townsite remain the property of Ouray County. Certain existing roadways within the townsite will receive periodic County maintenance by the Road and Bridge Department to ensure that access to other properties within the townsite is maintained. The maintenance will be the minimum necessary to provide reasonable vehicle access during the summer months. This may include some roadbase and grading sufficient to fill ruts, potholes and control runoff. This work will be done only on the existing road right-of- ways and not across private or public property in the Ironton townsite. A parking lot is adjacent to the office/changing room on the west parcel. 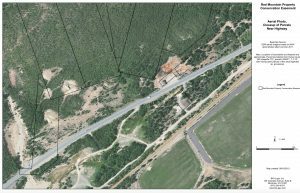 It is anticipated that this may be enlarged to provide additional parking and provide a safer access off of Highway 550. Some resurfacing of the parking area and guardrails may be installed to improve public safety and provide protection to the property. The area will be limited to parking for up to 20 vehicles. Additional parking for another 20-30 vehicles could be appropriate if needed east of the highway where the burned structure is located. This parking may include the County owned streets and alleys in the Ironton townsite. There are several gullies that cross through both parcels. To ensure that the conservation values of the property are not jeopardized; it may be necessary from time to time to implement measures to control erosion, redirect runoff, mitigate snow and rock slides, and stabilize mine waste piles. When any of conditions are detected that are or will cause deterioration of the values of the property, a plan will be made and presented to the Grantee to address the identified problem. No actual work, except to address emergency situations that may be life threatening or result in significant property damage, will be undertaken without Grantee approval. A major reason for acquiring the property is to prevent development, as it is a prime location for upscale vacation homes. Any development that may be considered will be limited to historic preservation and minimal infrastructure to accommodate limited numbers of visitors. The Conservation Easement Grantee will have to approve any proposals. The 2003 Management Plan stated “a plan will be developed to promote the values of the property through various techniques to include signage, possible location of a maximum of two kiosks, possible warning signs regarding prospect areas, trail signs and other signs. It is important that the historic values of the property be identified with signs that blend in with the natural features of the property. It may also be necessary to place signs that address public safetyconcerns”. A sign and kiosk plan has yet to be prepared. OCHS should be consulted to determineif one is needed. The Conservation Easement Grantee will have to approve any proposed kiosks. In 2004, the County erected a sign that identified the Great Outdoors Colorado Fund as a contributor to the purchase of the property. That sign has disappeared. OCHS is willing to produce an interpretive sign and affix it to the Larson Brothers office/changing room IF Ouray County will reimburse OCHS for its hard costs (estimated to be about $150). Such a sign could include acknowledgement to both GOCO and the Idarado Resource Damage Fund for their contributions to the project. There may be other items that will require special plans and approvals. These will be identified and addressed as appropriate. This plan will be reviewed and updated at least every five years on the initiation of the Grantee. Either the County or the Grantee may propose projects or amendments to this plan at any time. The Ouray County Board of Commissioners has the responsibility for the administration of County assets. This Plan will be included in the County Asset Management Plan. The County Administrator has the day-to-day responsibility, as authorized by the Board of Commissioners, for administration of the County Asset Management Plan, subject to the availability of funds budgeted by the Board of County Commissioners and availability of resources (i.e. staffing, occupation specialty, etc.) for implementation of the Plan. The Board may appoint, from time to time, various committees or establish other procedures for the purpose of gaining public input into the administration of County assets. All planning and project proposals will be developed according to the Conservation Easement, the Baseline Report and the Department of Interior Guidelines for Historic Preservation. Other State and Federal Regulations may be applicable, depending on the types of projects. Whenever permission of the Conservation Easement Grantee is required, the County must notify the grantee in writing at least thirty (30) days prior to the date the County intends to undertake the activity in question. Grantee shall grant or withhold its approval in writing within thirty (30) days or less. 1) OCHS is willing to produce an interpretive sign and affix it to the Larson Brothers office/changing room IF Ouray County will reimburse OCHS for its hard costs (estimated to be about $150). Such a sign could include acknowledgement to both GOCO and the Idarado Resource Damage Fund for their contributions to the project. 2) OCHS should be consulted to determine if a historical assessment of the Larson Brothers Mine is needed, and whether or not OCHS is willing to undertake one. 3) Request the Ouray County Weed Control Officer conduct an annual inspection of the site between June and August each year to determine if there is a need to do weed control. This Management Plan for the “Garard Property” is hereby approved by the Board ofCommissioners and the Trust for Land Restoration.